I've been working really hard on this "no spending" thing since the New Year... but its literally not possible. I need food. And I need to decorate. (Is it weird that decorating is right next to food on my priority list?) I essentially live and work in the same room, so this place needs to be festive. 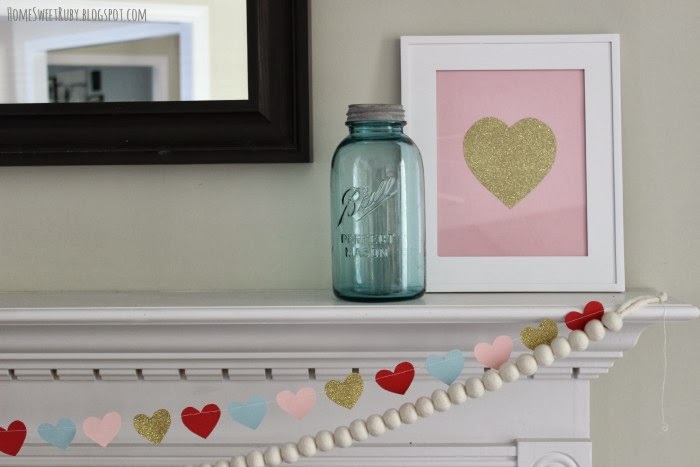 This is a super easy project that will cost you about $2 depending on the paper you buy. I found the glitter scrapbook paper at Joann's and it actually has adhesive on the back. I used the leftover for a heart print and will probably stick some to a few drink stirrers or something completely unnecessary. I gave a really quick overview of how to make felt garland this fall, so this is nothing new, but I thought it might be helpful to do a little better explanation with more photos! And yes, you can sew on paper without it breaking your machine. If you don't have a sewing machine, you can just string these together with some red or pink baker's twine! 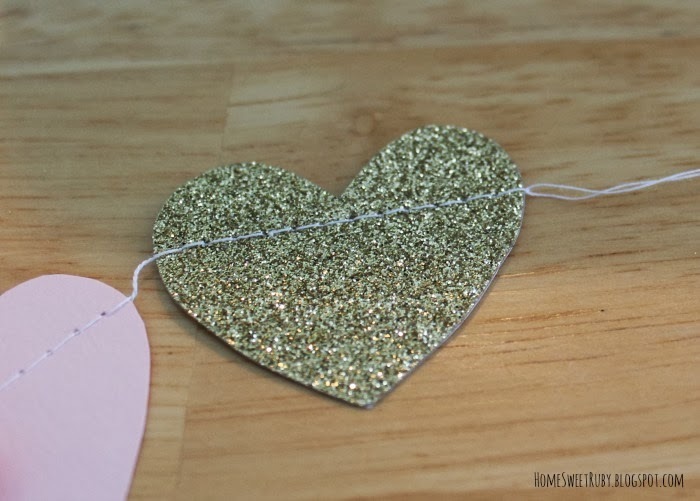 First cut hearts from your scrapbook paper and thread your machine with a light color. 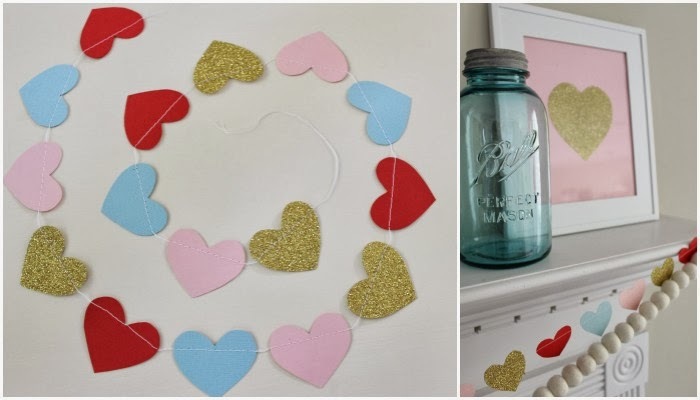 I used regular white thread because it would blend in with the white mantel, but you will see it on the hearts regardless of the color so it doesn't matter. Start by pulling a few inches of thread off to the side that way you have some to tie onto your mantel or wherever you are hanging the garland. 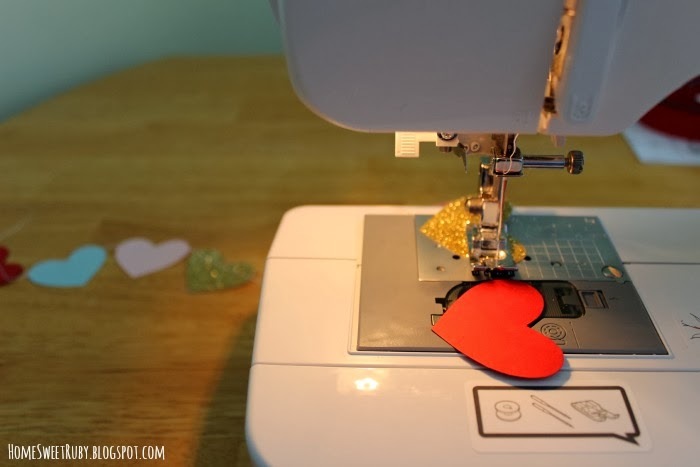 Place the first heart into your sewing machine and slowly start to stitch. No need to back stitch here. 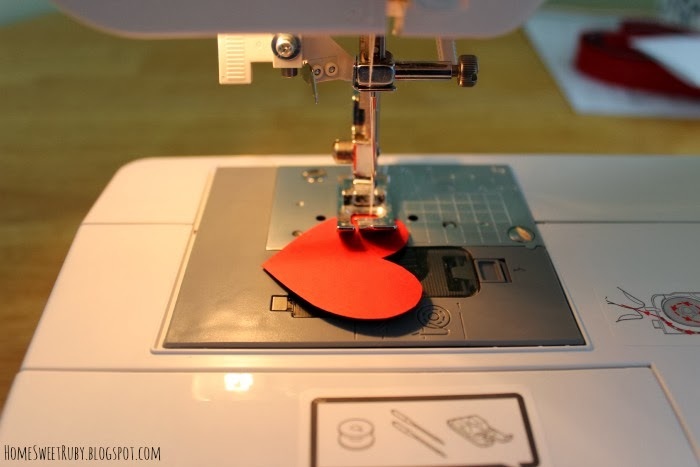 Once you get to the end of that heart, continue sewing for a couple seconds and then feed the next heart through. Once you are done, pull the garland away from the machine a few inches again and cut the thread so you have some left to tie. 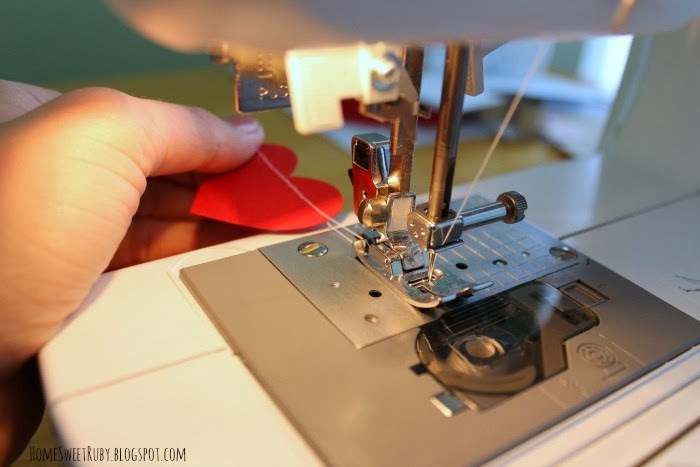 Make a double knot with the thread on the first and last hearts just to keep the thread in place. I've been giving our place a little Valentine's makeover and I can safely say it's is getting more festive with every pink heart and/or obnoxious gold glittery item I've added. 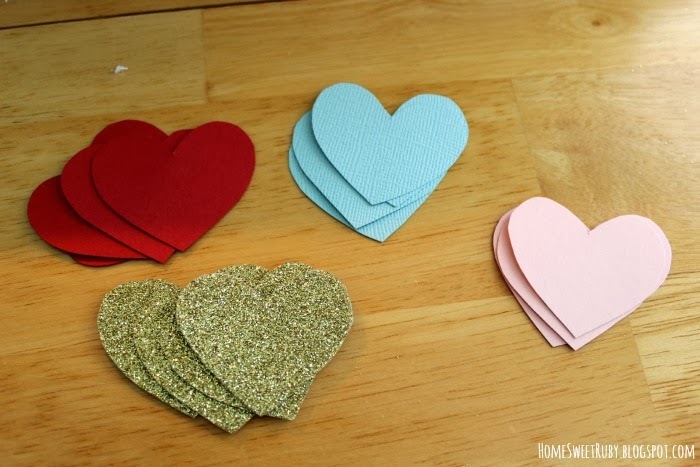 Also I find when you're crafting for Valentine's Day it helps to keep some candy hearts available at all times. I've fished most of the pink hearts out from the top so I guess I'll have to start digging for those. Please excuse the string I forgot to hide! I love how this turned out and I think the colors are really pretty, especially with the antique blue mason jar on the mantel. I'm hoping to score a couple more on the cheap and use them as vases or candle holders for our spring decor. So simple, yet such a good idea. I love that it is cheap to! I love simple, but pretty decorations like this! So cute! You'll make to make me one since I don't have a sewing machine! Such a smart idea! I'm saving this! So cute! I'm a slacker and don't decorate for Vday. sew a garland. wow. would have never thought. :) thanks for the idea. Okay, I'm obsessed with this. Pinning now!!! I LOVE THESE!! Ok I'm totally breaking out my sewing machine tonight! Thanks for the inspiration! Your garlands are always the cutest! I love how you used the extra gold glitter paper to make the framed piece as well! That is too stinkin' cute. I like how you used blue so it's not too little kiddy. Perfect end result! So cute! 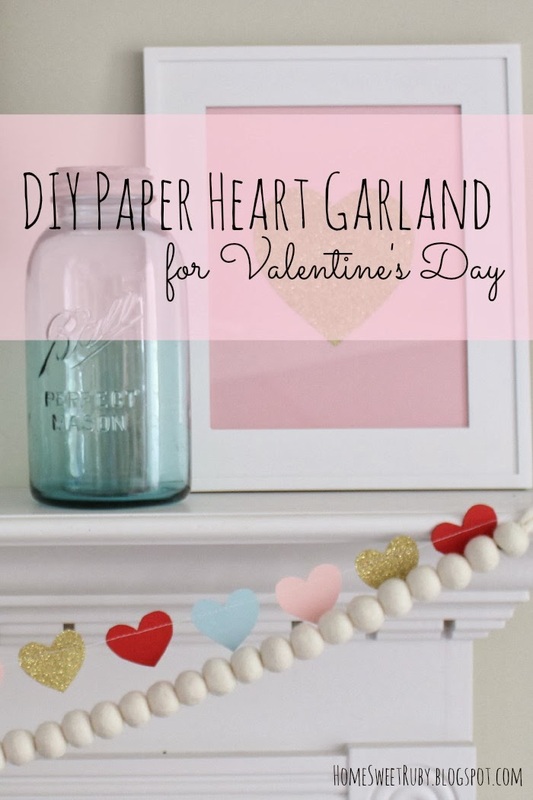 I made a heart garland last year with Baker's twine and I find that my hearts tend to want to flip over? Annoying none the less! I love it! Unfortunately, I am not sewing maching savvy, but I love the diy! Love how this looks! And you are too funny that decorating comes right after food! Look at you, crafty girl! LOVE it! We're decorated over here. I love holidays and must decorate. Love that heart garland. so pretty and I love the touch of blue! i'm gonna have to do that. really cute.